WOODS HOLE – The saying goes, “Near the sea, we forget to count the days,” but I sure am counting them now. Next week, we reluctantly will leave one of the most beautiful spots on this earth. For three years, my family and I have been fortunate to live in the six-bedroom house adjacent to Nobska Point Lighthouse on Cape Cod. My husband is US Coast Guard Captain Russell Webster, responsible for the 3,000 square miles of ocean between Duxbury and the Rhode Island/Connecticut border. His job is the reason we get to live here. Nobska Lighthouse, operating since 1828, was automated in 1985, eliminating the need for full-time lighthouse keepers. Since then, the house has served as the residence for the commander of the Coast Guard Group Woods Hole. Among his many duties, my husband has led Coast Guard operational forces during recovery operations for John F. Kennedy Jr’s plane and Egypt Air flight 990, for security details for President Clinton’s family visits to Martha’s Vineyard, and the Newport parade of Tall Ships. Our house sits on 4 acres of prime real estate at Nobska Point at the confluence of Vineyard Sound, Nantucket Sound, and the sometimes treacherous waters of Woods Hole Pass, which connects Buzzards Bay to Vineyard Sound. Every room but one offers gorgeous ocean views, and from these windows we have seen it all: blood-red sunsets, soaring red-tail hawks, a double rainbow following a December snowstorm, and the latest, best, and worst in bridal fashion and etiquette. I see the sun rise over the kitchen sink and watch it set from the bay window in front of our kitchen table. Sometimes, the views are so spectacular that I’ve had guests offer to pay me to let them do my dishes. One clear fall night, my husband’s older brother, who holds a graduate degree in business, asked quite seriously, ”What’s that orange thing over there?” We laughed and said, ”It’s the moon.” In his defense, the harvest moon that year did seem especially large and orange, hanging low over the ocean. The roadway near the lighthouse is a favorite viewing spot for the annual Falmouth Heights fireworks display. In 1999, my husband and son Andrew, then 11, were enjoying the fireworks from the east side of the lighthouse catwalk, 40 feet up in the open air. They soon found more interesting fireworks on the grass below: an amorous couple caught up in the heat of the moment. One year ago, on the morning of my daughter Noelle’s 6th birthday, she screeched in delight at seeing a huge wild turkey from our family room window. The turkey circled the house all day then was never seen again. Maybe it was scared away by the life-size Barbie doll that we put in the lighthouse cupola that night in preparation for my daughter’s Barbie treasure hunt birthday party the next day. That night, we heard drivers slowing their cars to gawk at the apparent damsel in distress in the lighthouse. 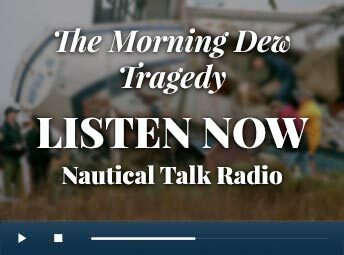 We’ve also seen tragedy, including the great outpouring of grief following the deaths of John F. Kennedy Jr., his wife, Carolyn, and her sister, Lauren Bessette, in his small plane off Martha’s Vineyard on July 16, 1999. A year to the day after my husband assumed command of Coast Guard Group Woods Hole, he was paged early in the morning that JFK Jr.’s plane was missing. My husband quickly went to work. On July 22, from our second-floor guest room, Andrew, Noelle, and I watched as my husband accompanied the Kennedy and Bessette families and the ashes of the three victims in the USCG Cutter Sanibel as it rendezvoused with the anchored USS Briscoe. We watched as the grieving family members, the Navy band, and others transferred to the huge Navy ship, which quickly weighed anchor and sped southwest toward the memorial position over the crash site off Martha’s Vineyard. While our life has been legitimately interrupted by tragedies at sea, our home life also has been regularly disrupted with quirky requests and intrusions. I guess it’s to be expected when annually, more than 3,000 people tour inside the lighthouse, thanks to the Coast Guard Auxiliary Flotilla 11-2, and another 10,000 visit the public grounds outside our picket fence. 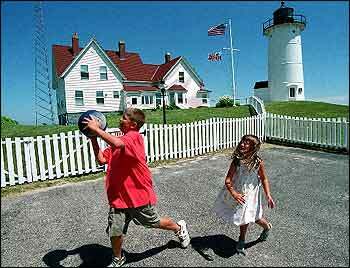 For two years, Yankee magazine has designated Nobska Lighthouse one of the top 100 places to visit. More than three dozen people have bypassed our ”Private Beyond this Point” signs to ring our doorbell well past 8 p.m., usually to inquire about getting a lighthouse tour. I’ve been up at 6 a.m. to find people peering in our kitchen windows. One morning, I looked out the bathroom window and saw a young man in a tight spandex outfit vigorously doing his morning exercises in our private backyard. Another time, a photographer accosted us on our private grounds and demanded that she be let in our house to take pictures. ”This is federal property, and I’m a taxpayer, so I’m entitled to come in,” she announced. Two summers ago, we discovered an uninvited guest when my daughter found a bed of hay, a ground cloth, and a case of half-consumed Michelob beer under a bush. The local groundskeepers estimated the hobo had been living there for at least two weeks. Power outages and lightning are common since we are at the end of the local power grid and have a 125-foot-tall metal communications tower in our backyard. Our first Thanksgiving here, thankfully after dinner for 20 had been served, the power went out for five hours. We huddled around the blue glow of our 5-inch, battery-operated TV, watching football games. To complete the experience, the fog horn sounded continuously, as it is designed to do when commercial power is lost. Our departing guests said they actually enjoyed the trip back in time with conversation, pie, and candlelight. Weddings are special occasions of great happiness for most people. At Nobska, we have witnessed many of the 75 weddings held each year near the lighthouse. June 30 was a banner day, as we observed seven weddings. One young couple had been granted special permission to wed at the top of the lighthouse at sunset. Personal, loving vows had been prepared by the bride and groom. Unfortunately, the pre-wedding partying caused the principals to be late for their own festivities, and it was dark by the time they arrived. The slightly drunk participants, in full wedding regalia at the top of the lighthouse, were forced to read their specially prepared vows staccato fashion, timed to the lighthouse beacon flashing once every six seconds. The worst wedding for us was when the kids and I arrived at our driveway to find at least 40 cars parked on our lawn and a state trooper telling us we couldn’t come in. The wedding couple had invited more than 200 guests, put up a circus tent, and hired state troopers to direct traffic onto our lawn. To add insult to injury, we watched one of the ushers in tuxedo relieving himself on the grounds. Weddings are now limited to 50 people. Two years ago, a young man politely approached us explaining that Nobska Light had been the setting for his first date with his girlfriend, and he was hoping it could be where he proposed to her that night. We engineered a plan where she would think my husband was giving them a tour at 5 p.m. He unlocked the lighthouse for them, and a short while later, we saw the happy couple exit the lighthouse with tears in their eyes and a beautiful diamond ring on her left hand. The Falmouth Chamber of Commerce sponsors caroling at the lighthouse the first Friday evening in December. We put out cookies, hot apple cider, and coffee and join the carolers, which last year totaled about 75. The next day, the Coast Guard Auxiliary Flotilla 11-2 opens the lighthouse for public tours, and Santa arrives. The Flying Santa and his elf have landed on our lawn by helicopter the last three years on the second Sunday of December. For 72 years, Flying Santas of one sort or another have visited lighthouse keepers and their families at 28 lighthouses in six states, bringing practical gifts such as hot cocoa, dog bones, toothpaste, shaving cream, and coffee. The modern-day Flying Santa also dispenses toys by our Christmas tree for the children of local Coast Guard families. We found the winters isolating. Strong winds made the windows rattle loudly and the siding peel away. Sometimes, I’d really have to force the front door open and have Noelle hang onto my hand for dear life as we went to catch the school bus about a quarter mile away. I’m ashamed to say there were two mornings when Noelle played hookey from school simply because we didn’t feel like dealing with the wind. I think the Nobska yard zoo followed a funky kind of Chinese calendar. The first year was the year of the Woods Hole skunk, which has more white fur than black. The second year, hairless newborn baby bunnies came popping out of a hole when we watered the garden. This year, when I was out back reading a book, I looked up and saw a fox staring at me about 20 feet away. Later, I looked out one of my family room windows and saw two baby foxes, called kits, playing by the bushes. I saw the mama fox kill a squirrel and take it into the bushes with the kits. 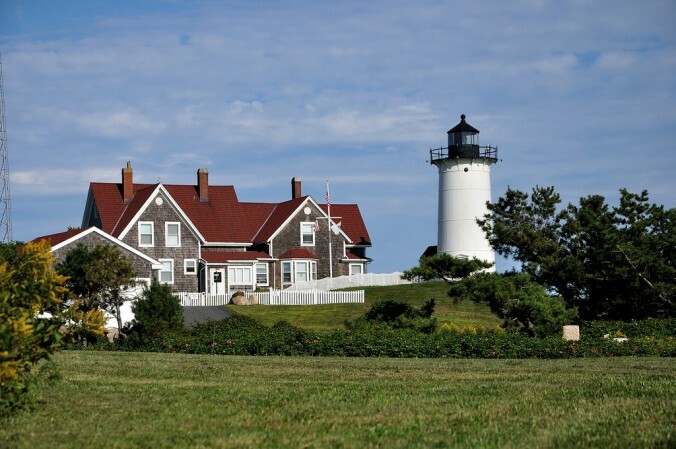 While we look forward to moving back home to Cape Elizabeth, Maine, where my daughter says ”people won’t be looking in our windows and peeing on our lawn all day,” we will always treasure our special time at Nobska Lighthouse. As a previous group commander and his wife did on their last night, we undoubtedly will be on the lighthouse catwalk at sunset, teary-eyed, as our views from Nobska come to an end.